The view up the north end of Crocker Lane on Sunday afternoon.. This is the case of a deadline past and gone. The northern 2,100 feet of Crocker Lane was supposed to be turned into a fully developed city street with a new water line underground by Nov. 3. Looks like finishing the job will take a bit more time. I asked about the status of this project on behalf of a reader in early October. Chris Cerklewski of Albany Public Works told me then that the contractor was working toward getting the roadway completed by the end of October and finishing the sidewalks and landscaping by the end of November. Carter & Company Inc. of Salem was awarded the construction contract in May based on its low bid of $1,861,694. According to what Cerklewski told me last month, the contractor will be liable for liquidated damages of $800 for every day beyond Nov. 3 that the project is late. Though unpaved, the street has been open for local traffic, and a detour is in effect for others. I am so impressed with all the workers and how nice Crocker is becoming. They have been so patient with all the Locals driving through and around them. Sometimes you win and sometimes you lose. In this instance, the latter is the case. The case being: Always taking the low ball bid. May the sun come up tomorrow. I think maybe you meant the northern end of Crocker not the southern end…! Of course. Thanks for catching this. The bottom half of Crocker lane is in bad need of repaving as well. All the construction traffic hasn’t helped. There really needs to be a traffic light at Crocker and Gibson hill road as well. 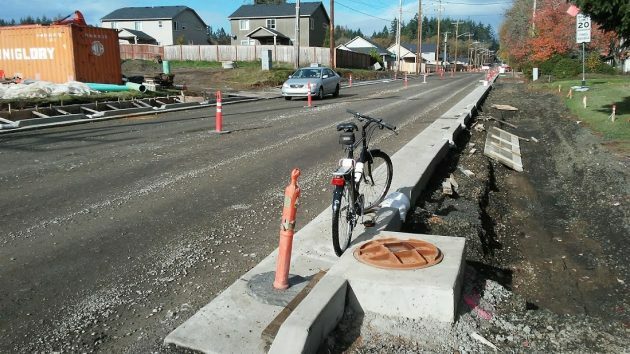 To pave the least traveled half of Crocker lane doesn’t make sense. A cursory glance at Google maps will tell you that there is really no such thing as a “least traveled” half of Crocker. Also, the circle at Gibson Hill and North Albany Road, though a bit undersized, is a marvel of efficient traffic flow– even when being used by people who can’t quite figure out the concept of, “yield to cars in the circle.” To place a light at Crocker/Gibson Hill, (half a mile away) and make people unnecessarily wait in both directions would be criminally silly.